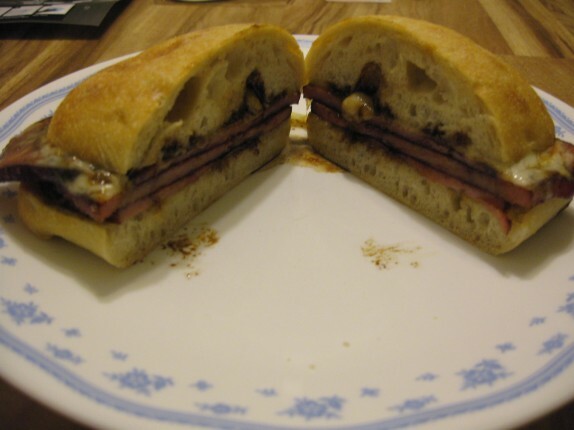 As I mentioned in derryX cooks: City Ham Dinner, the whole reasoning for me to cook that ham was to make my favorite sandwich, Grilled Ham with provolone cheese and a balsamic reduction. The first thing I did was slice the ham nice and thin. I warmed it in a frying pan with a small amount of butter, placed it on ciabatta bread. In the meantime, I reduced 1 cup of balsamic vinegar with 1 tablespoon of honey in a small saucepan. 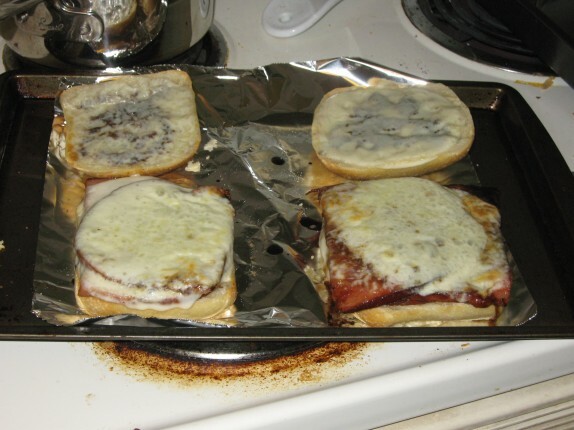 Once a thick syrup, I drizzled this over the ham and bread, added a few slices of provolone cheese and tossed it all under the broiler until the cheese melted. Great effin sandwich. I don’t think it’s too bad. The ham is somewhat lean. I’m not big on cheese so just one slice per side for me.